Displays the New dialog for creating a DBF file. Displays the open dialog for opening the existing DBF file. Appends records from current file to other DBF file. Prints records from file. 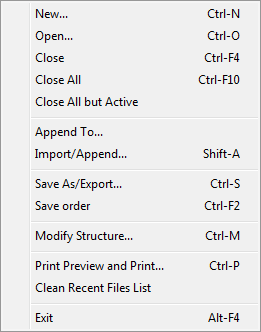 If you want to print not all columns, select the necessary columns on the Fields Info dialog (Shift-F2).